I have fond memories of the winters in Tehran. Each of the four seasons were beautiful in Tehran for me, but the falling of the leaves in autumn was always exciting as winter slowly arrived. And with winter also came snow. There was something very magical about waking up in the morning and seeing everything covered in white. It was even more exciting when schools had to close down because of snow. Oh how loved those days! As of today we are officially entering the winter season which markes the Winter Solstice and the longest and coldest night of winter. Shabeh Yalda either falls on the 21st or 22nd of December. During this time of the year many Persians set up a Korsi, which is made up of a short square table covered with a large comforter or thick blanket with a heater placed underneath the table. Comfortable cushions are placed on the floor for people to sit on and cover their legs with the blanket. This is a very old ritual which has been done from many many years. It is such a simple thing to do, but it is incredibly nice and comfortable to just sit and enjoy the warmth. People will sit around the Korsi for hours chatting away, drinking tea, and also eating dinner. One of the traditions of Shabeh Yalda, which means night of Yalda is to eat Ajil, which is a combination of dried fruits and nuts. In Iran the combination of the ingredients of Ajil slightly changes depending on the occation for which it’s prepared for: Jashneh Mehregan, the Persian Autumn Festival, or Shabeh Yalda. What I have found in Los Angeles is that the Persian Markets always have a tub of their own Ajil. 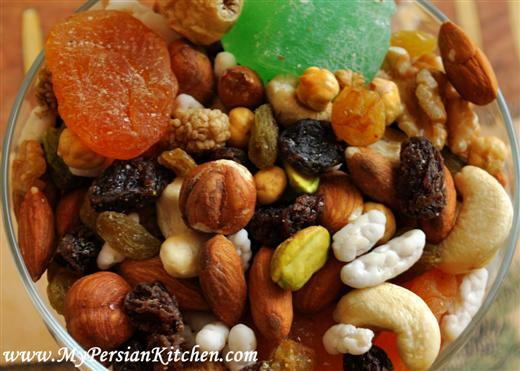 Of course, you can make your own combination as well by picking and choosing your favorite nuts and dried fruits. Personally, I am a huge fan of the Ajil mix at Jordan Market in Westood. It has a bit of everything and I love the diversity of flavors. It’s a like a party in your mouth!!! This is a what their Ajil is made with: dried apricots, Turkish Delights in various colors, walnuts, cashews, almonds, dried chickpeas, noghl (sugar coated slivered almonds), dried mulberries, dried figs, goden raisins, dark raisins, and pistachios. In our family Shabeh Yalda also means my Mom’s birthday. If memory serves me correct my grandma told me that she was born during Shabeh Yalda which that year fell on December 22nd. For some more information about Shabeh Yalda and a beautiful passage from Perisan poet Hafez, please take a look at fellow Persian blogger Azita’s Turmeric & Saffron blog. Shabeh Yalda Mobarak doostaneh aziz! We wish you all a very happy Shabeh Yalda and Winter Solstice! 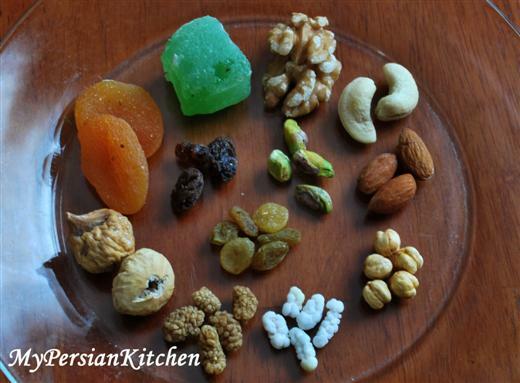 dried fruit Food Iran Iranian Food Blog Iranian Recipe nuts Persian Persian Food Persian food blog Persian Recipe Shabeh Yalda Snacks Trail mix Winter Solstice! Thank you Mehrdad Jan, same to you! what is the Green Yoda thing? Have a very happy shabe Yalda and thank you so much for the link. 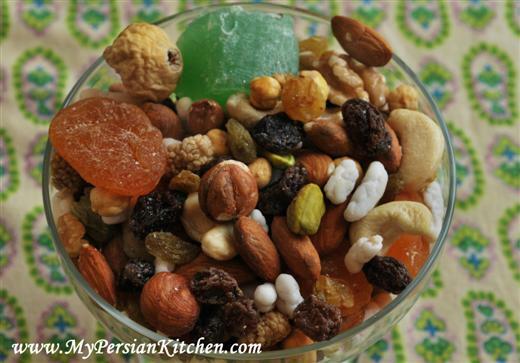 I love the Persian trail mix, I think I have all of them except “noghl” and “fandogh”. Happy Yalda! Oh no!!! I just realized after reading your post that I left out the hazelnuts!!! I must have eaten them before I got to the picture taking part!! What a lovely ritual! Is Ajil associated with good omen or luck? History of Greek Food, it is believed that eating nuts symbolizes prosperity. Renata, yes, the “Green Yoda” is a Turkish Delight!!!! !